Drunk jenga one is an old favorite from my university days (oh, to be 20 years old again!). Me and my student buddies used to play it while pre-gaming (as in getting really drunk on cheap booze as soon as evening time hits, so that by the time we are all ready to go out and hit the night clubs, we’re pretty tipsy and don’t have to spend what little money we have on expensive, watered down drinks at nightclub bars) and drunk jenga is a very good way to cause some trouble and maybe get a bit of flirting and jokes going amongst strangers/newbies to the group! 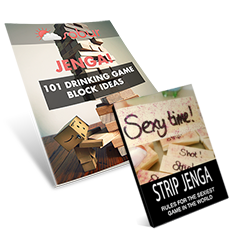 Note: Our jenga drinking game block ideas are so popular that we’ve compiled them all into one easy to read block idea book! Never Heard of or Played Jenga Before? In terms of home ‘board games’, Jenga is second in popularity world-wide only to Monopoly. It was introduced to the world by the enterprising Leslie Scott, a British woman born in East Africa who moved to Ghana, West Africa as a child. Jenga, a Swahili word meaning “to build“, is such a simple game to understand, but also a complex and somewhat stressful game to master. Apparently the children’s wooden building blocks that Leslie and her family used throughout her childhood were bought locally in a town known as Takarati (Takoradi) in Ghana during the early 70’s. The Takarati wood mill is still operational today. The game is well known amongst the Asanti people of Ghana, where it called, “Sidan”, which means, “To build the House”. While trying to get the game to market, Leslie Scott suffered through bad business relationships, patent and branding troubles, insufficient funds and lack of a platform for her game for years. But due to that special Jenga magic that seems to draw people near, she succeeded. This ‘special magic’ proved invaluable as Jenga’s prowess reached first a small circle of friends, and then a circle of companies, and finally encircled the world with a pair of wooden arms! Jenga really is as simple to play as it sounds: during the game, players take turns removing one block at a time from a tower constructed of 54 blocks. Each block removed is then balanced on top of the tower, creating a progressively taller but less stable structure. So now you know the history and basics behind plain ‘ol regular jenga, let’s get into the fun stuff: the jenga drinking game! The basics: Rules are the same as regular jenga. I.E. take turns removing one block at a time from the tower and placing it on top without knocking the tower over. Where it gets tricky (and fun) is when you write different crazy challenges on each of the 54 jenga blocks with a sharpie. Remembering that you can only use one hand, when (if!) the block is successfully removed, the rule on the block is followed. The person who knocks over the tower receives all of the ridicule and surprise that they would in a normal game of Jenga, only now they also have to down their entire drink and then pick 2 blocks to follow as extra punishment. Now that you know the rules of drunk jenga, you’ll want some help and inspiration for choosing the challenges to write on your jenga blocks. Throw this block at someone. If they miss it, they drink. If they catch it, you drink. Giant Jenga: How To Level Up! If you and your drinking buddies want to take your game of drunk jenga to the next level; up-size it and get some jumbo jenga in your life! The same rules apply as in normal drunk jenga, although you may want to remove that one hand only rule to be fair to everyone playing. The best place I’ve seen for getting hold of your own giant Jenga set is Amazon. If you want even more (quality) drinking game versions of popular board games, check out our Twister drinking game page! Strip Jenga: The Dirtiest, Funnest Drinking Game Ever! As is the case with anything wholesome, if you add drinking and alcohol to it, it becomes an order of magnitude better! Strip Jenga (or naked jenga, whatever you want to call it!) is a perfect example of this. Strip Jenga Game Download: We have made our strip Jenga rules/block ideas list available for download in one easy to read Strip Jenga block idea book! Remember, once you’ve finished having fun and (very likely) getting pretty drunk after playing jenga drinking games, try a Sobur hangover remedy to banish the next-morning hangover and wake up feeling great! 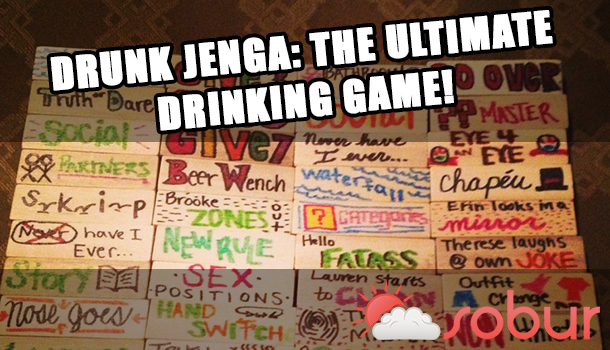 Want More Jenga Drinking Game Block Ideas? Our Jenga drinking game post has been so popular that we decided to put together 101 great Jenga block ideas into one easy to read eBook. There's gold in this jenga drinking game ideas book, like the 'Anchorman' block and the 'Gun Show' block, enter your email to download the PDF now & see the hilarious rules! Bonus: Get our 'Strip Jenga' block ideas book as a free extra & play the extra naughty, stupidly fun game with your friends!